HOFFNUNG for CHRISTMAS? an ideal Christmas present for yourself or your friends. This release, Volume 1 of a projected Bridge series, usefully combines works spanning twenty years of Bridge�s composing life and, as such, provides a most interesting and revealing survey of his musical progress. The earliest piece is the tone-poem Mid of the Night completed as early as 1903 and first performed in 1904. Then the piece lay forgotten for more than ninety years! As might be easily guessed, this work is hardly characteristic of Bridge though it already exhibits a quite remarkable orchestral mastery. The shadow of, say, Tchaikovsky and Liszt looms large, but Bridge�s means were obviously up to his ambitions for this is a quite substantial work and a worthwhile addition to this composer�s discography. A most welcome novelty indeed for now we clearly know from where Bridge started. Isabella, written a few years later in 1906, shows a clear advance in terms of structure rather than of idiom. It is another example of Bridge�s ability to write in long paragraphs even if the work�s program still adheres fairly strictly to Keats� poem. Bridge�s achievement is the more remarkable for this reason. One of its most endearing features is the warm lyricism it exudes. There are some wonderful themes, such as the one started on oboe representing Isabella, and some fine orchestral touches. Bridge�s mastery is again evident throughout. This lushly and warmly scored piece was recorded many years ago by PEARL (SHE 568, maybe available in CD format now). The Two Poems of 1915 may be somewhat better known for they were also recorded years ago (LYRITA SRCS 104 nla and unfortunately not re-issued in CD format at the time of writing). These short pieces are based on texts by Jefferies and might still be considered as tone-poems though they evoke more complex emotions that are reflected in the idiom used by Bridge. In these pieces he may have been quite near to the world of Delius and to that of French Impressionism (actually they may be the sole piece by Bridge which might have brought him towards larger audiences). The first piece is a lovely Pastorale lightly and subtly scored whereas the second one is a lively colourful Scherzo. As such the Two Poems may be viewed as a transitional work in Bridge�s output for he did not actually continue composing in this vein. Indeed, the aftermath of World War I was to shatter Bridge�s newly acquired status. His style will soon change dramatically and become more radical, and his first major piece after the War (the powerful Piano Sonata) in which Bridge�s more radical thinking is prominent, will estrange him to his later audiences for too many long years. Enter Spring of 1927 is one of Bridge�s finest mature works. This richly and subtly scored rhapsody shines as a pure jewel. It is a sunny, colourful, exuberant work in which Bridge�s supreme orchestral and formal mastery is at its greatest. Bridge�s remarkable scoring abounds with invention and imagination, especially in the central pastoral section which is magical. The work exults in a brilliant peroration evoking the arrival of Spring in a most lush and grand manner. Later, Bridge�s maturity will yield some other wonderful masterpieces, such as the last string quartets, the superb Second Piano Trio and � above all � his unquestionable masterpiece Oration for cello and orchestra. 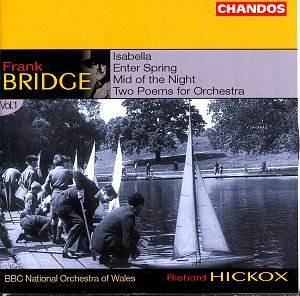 But Enter Spring is undoubtedly the first of Bridge�s late masterpieces. So, this Volume 1 augurs well for the rest of this new series. Hickox conducts finely paced performances of all these pieces and the BBC National Orchestra of Wales respond with wholehearted enthusiasm and dedication. Warmly recommended.